Porsche's 2017 Macan is a small SUV blessed with the German automaker's invigorating driving dynamics. Better viewed as a tall, all-wheel-drive hatch than rugged off-roader, the Macan is aimed at those seeking SUV functionality and sports-car performance. At roughly $50,000, price of entry is above rivals like the Jaguar F-Pace and Audi Q5. If you want a small luxury SUV with the Porsche's renowned performance, the Macan is the little brother to the Cayenne that you've been awaiting. As the least expensive Porsche, the Macan is also one sweet ticket into the prestigious brand. Though a sub-$50,000 starting price is a deal for a Porsche, it's still a stretch for an entry-level SUV. If you want a bargain-performance SUV, look to the oft-overlooked Infiniti QX50. If you can compromise on the performance aspect, the Mercedes-Benz GLC and the Macan's Audi Q5 cousin are great alternatives. The 2017 Macan lineup doubles with the performance-oriented GTS that slots between the Macan S and Macan Turbo, while a new base model arrives with a turbocharged 4-cylinder engine. New standard features include lane-departure warning and front/rear parking assist with rearview camera. Apple CarPlay compatibility also becomes available. The Macan has a 2-row, 5-passenger configuration. Porsches have long offered a variety of color combinations, and this one's standard upholstery is leather or suede-like Alcantara. The front seats engulf you and range from standard 8-way power-adjust comfort versions to 18-way sport variants. The array of buttons surrounding the gear shifter could rival those in an airplane cockpit. The view out is IMAX wide. Second-row legroom is stingy, however. In back, the 17.7-cubic-foot cargo floor expands to 53 cubic feet by dropping the 40/20/40-split/folding 2nd-row seatbacks. That compares poorly to SUV competitors like the BMW X3 and Audi Q5. Profiled to look a bit like a 3/4-scale Cayenne, the 2017 Macan's tidier proportions are more akin to a tall hatchback than a compact SUV. It's not snap-recognizable as a Porsche, either. All trims of the Macan boast bi-xenon headlights and fog lights, while the GTS and Turbo models have unique, more aggressive front fascias. GTS models have a matte-black finish on the side blades and a more dynamic color scheme. They also sit 10mm lower than Turbo models. The Macan Turbo, meanwhile, can be identified via its front spoiler lip and squared-off quad exhaust outlets. Like its bigger brother the Cayenne, the 2017 Macan is among the sportiest SUVs. It is a Porsche, after all, even if it's in the form of a sport-utility vehicle. Even the "slowest" model is fast, with the new 4-cylinder Macan able to rush to 60 mph in just over 6 seconds. The Macan S and GTS shave another second off that time, while the range-topping Macan Turbo goes 0-60 mph in as little as 4.4 seconds. Not all that long ago, that was 911 territory. Like any other Porsche, velocity is only part of the formula. Road-hugging grip, a brilliant 7-speed PDK automatic transmission and the sensory growl of the exhaust make the Macan a Porsche through and through. The always-on AWD system optimizes traction in both wet and dry conditions, while an off-road button optimizes the Macan for lighter off-highway adventures by varying torque distribution and throttle response. With the new 4-cylinder Macan, price of entry into the lineup -- and the Porsche brand -- has dropped to $48,550, Manufacturer's Suggested Retail Price (MSRP). That's nearly $5,000 less than last year's Macan S, which now starts at $55,450. The 2017 Macan GTS opens over $68,000, and the Macan Turbo jumps to over $77,000. At these prices, the Macan is among the priciest of the compact-luxury vehicles. The Audi Q5, Mercedes-Benz GLC and BMW X3 start several thousand below a base Macan, as does the new Jaguar F-Pace, which aims to give the Macan its most serious competition yet. Another new kid on the block, the Maserati Levante, starts over $70,000. Before buying, check the KBB.com Fair Purchase Price to see what others in your area are paying. The Macan's resale value is expected to be great. In fact, last year's model won the Best Resale Value Award in its class. The new 2017 Macan base model cost thousands less than the Macan S (the former starter) but still comes nicely equipped. On hand are tri-zone climate control, lane-departure warning system, rearview camera with front and rear parking assist, power-folding side mirrors, power-operated liftgate, and 18-inch wheels. A fresh infotainment system is highlighted by a 7-inch multi-touch screen with AM/FM/HD/satellite radio with CD/DVD player, USB/aux inputs and Bluetooth connectivity. In addition to a more powerful V6 engine, Macan S model also have rain-sensing windshield wipers and tinted and thermally insulated glass. More powerful still, GTS models have 20-inch wheels, suspension setting and other performance upgrades, while the top-line Macan Turbo boasts navigation, Bose audio, Alcantara roof lining, adaptive seats and active suspension. Option packages range from a sweet Burmester audiophile system to a panoramic roof, and Porsche Connect Plus module with wireless Internet access, Google Earth integration and Apple CarPlay, plus a rear-entertainment system and heated/ventilated front seats. Customization options abound, as do performance upgrades that include Porsche Torque Vectoring Plus, $8,150 carbon-ceramic brakes and the recommendable Sport Chrono Package with Sport Plus mode, launch control and dash-mounted analog/digital stopwatch. Porsche's Style VP Michael Mauer bristles at the suggestion that the Macan is a baby Cayenne. He sees it more as "a big brother to the Porsche 911." One lap around an enclosed track proves Mr. Mauer is not prone to hyperbole. While many tout their car's horsepower and torque, performance potential is a moot point if the transmission can't effectively manage the output. Porsche's 7-speed dual-clutch automatic has no such issue, using the first clutch to hold the selected gear while the second clutch stands ready to instantaneously engage the next. The new base model is the first Macan to use a 4-cylinder, a turbocharged 2.0-liter that makes 252 horsepower, enough to zip this performance SUV from 0-60 mph in 6.3 seconds (or 6.1 with the Sport Chrono package). At just over 3,900 pounds, this is also the lightest Macan. All others use a twin-turbo V6 engine -- a 3.0-liter in S and GTS models and a larger 3.6-liter in the Turbo. All Macans use a 7-speed PDK automatic transmission and are all-wheel drive. For better fuel efficiency, they have an auto start/stop system that switches off the engine at traffic stops. Start-ups can be abrupt, and thankfully the system is defeatable. A V6 Macan can tow up to 4,409 pounds. The 2017 Porsche Macan is a small SUV blessed with the German luxury automaker's invigorating driving dynamics. Better viewed as a tall, all-wheel-drive (AWD) hatch than rugged off-roader, the Macan is aimed at those seeking SUV functionality and sports-car performance. While there is a slew of rivals in the burgeoning compact-luxury SUV segment, the Macan is among the few that can back up its performance claims. With a new, sub-$50,000 4-cylinder base version, Porsche will surely attract even more buyers facing temptation from the likes of the all-new Jaguar F-Pace and the Maserati Levante. But with prices that can zoom past $80,000 for a Turbo model, the Macan remains a pricey proposition. 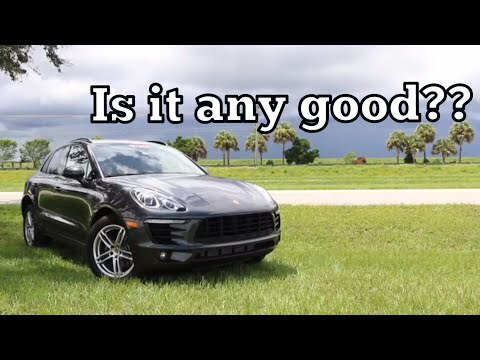 2017 Porsche Macan 2.0 Review - An Affordable Porsche? Feels like a luxury car but goes off-road with ease. The Porsche Macan has needed no repairs other than the first 2 scheduled maintenance events. The Macan is spectacularly fun to drive. It has very fast pickup, which is multiplied when in sport mode. At first, the beautiful red leather cockpit-like interior was almost overwhelming to operate (it required a 45 minute session with the dealer to learn all the interior functions ), but within a week, I had it all down. In spite of the fact that the Macan is clearly designed as a luxury car, it has surpassed my expectations in off-road situations. I do not “baby” my vehicle. My Macan has been back-woods “camping” more times than I can count, and performs beautifully in mud, snow, ice and heavy rain! When I first purchased the Macan, I was not sure if I should have purchased an “s” or turbo version of the car however, the base Macan was and still is a perfect choice for me! Luxury in a compact SUV. Versatility for everyday life. I love my car for many reasons. I love the reliability. I love the aesthetics of the car. The interior of the car is comfortable and beautiful. I like the utility of the car. It is easy to fit household items, my bike, and groceries. This is a wonderful car.